Hosted by His Grace, Bishop Maxim, of the Serbian Orthodox Diocese of Western America, at St. Sava Serbian Orthodox Church in Phoenix, Arizona, the Sts. 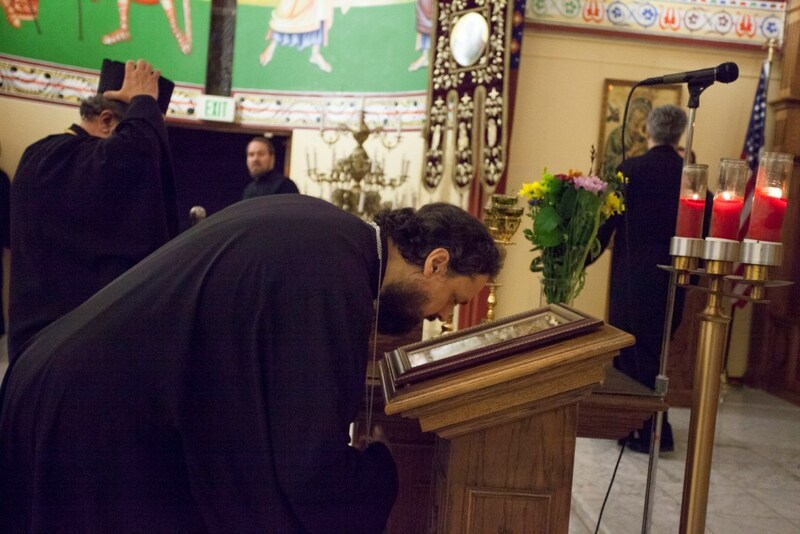 Sebastian and Mardarije Orthodox Institute began on Monday evening with the celebration of a Doxology service, followed immediately by Vespers, presided over by His Grace, Bishop Longing of the Serbian Orthodox diocese of the Mid-West. Attending the service was His Grace, Bishop Maxim and the clergy brotherhood of the Diocese of Western America. The event was especially marked by the presence of His Grace, Bishop Atanasije, retired bishop of Herzegovina. Vespers was followed by dinner. A wine and cheese tasting then gave guests the opportunity to meet Bishop Atanasije in person and receive his blessing. The assembly was also blessed by the presence of Bishop Daniel of Santa Rosa, newly-consecrated assistant bishop of the OCA’s diocese of the West. The retreat, which claims the patronage of Sts. Sebastian and Mardarije, will include multiple sessions over several days which will draw from the wisdom of Bishop Atanasije and his lifelong witness to the living tradition of the Orthodox Faith and life in Christ. The first full day of the Institute began Tuesday morning with the celebration of Orthros, followed by refreshments and the first session of the institute; Gospel, Revelation, and the Living Tradition. The session was chaired by special guest, His Grace, Bishop Atanasije, and was moderated by Bishop Maxim and Fr. Predrag Samardzic. As will be the case with all the sessions at the Institute, the content focused on the lifelong work and experience of Bishop Atanasije. The session provoked lively discussion and those in attendance received not only his Grace’s wisdom, but were also touched by his wit and abundant joy. In the afternoon, two more sessions were attended which focused on the topics of Freedom, Spiritual Warfare and the Cross, and Eschatology and Theosis according to St. Maximus. 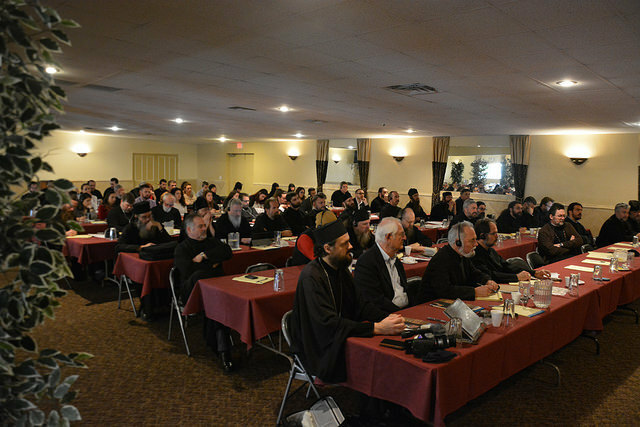 The sessions were again led by Bishop Atanasije, and were moderated by Abbot Damascene, Fr. Russell Radoicich and Deacon Zoran Aleksic, and Fr. Darko Spasojevic, Deacon Marko Bojovic and Deacon Daniel Kirk respectively. 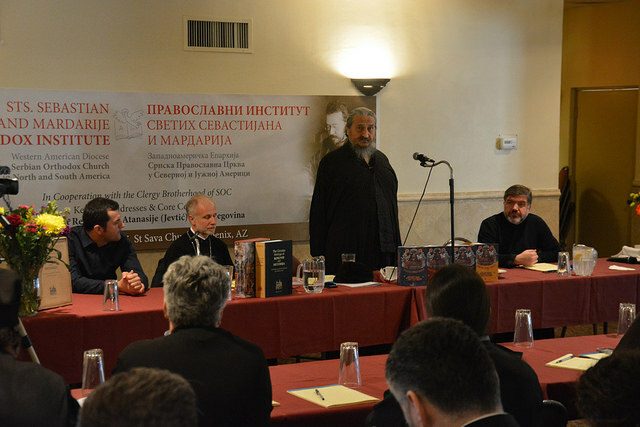 Again both sessions included significant discussion among participants, in which Bishop Atanasije guided all to see both the greater meaning in the topics as well as an understanding of their relationship to the everyday existence of an Orthodox Christian. Guests then enjoyed dinner before celebrating Vespers, presided over by his Grace, Bishop Daniel. Vespers was followed by the keynote address of the Institute, given by Bishop Atanasije, and moderated by Bishop Longing and Ivan Vuksanovic, which focused on the topic of The Eschata in Our Daily Life.